Island Scrub Jay by Dr. John V. Richardson Jr. Species profile prepared by Dr. John V. Richardson Jr.
Voice: Listen to Andrew Spencer’s recording at http://xeno-canto.org/27719 (accessed 3 June 2013) as well as other recordings of its voice at Avi-base. Sounds much like Western Scrub Jay, but more gravelly or with laryngitis. Diet: Omnivorous including insects, lizards, mice spiders, snakes, and other bird’s eggs, but Island oak acorns may be critical to its diet (according to Luke Caldwell’s Colorado State 2010 MS thesis), which it can eat due to its large bill size. Courting Displays: Feeding behavior. “Mating pairs are monagomous (sic) and may remain together for several years with separation of the pair usually being the result of the death of one (or both) members, according to Encyclopedia of Life (citing Atwood 1980). Nesting: 3-8 feet above ground. Of documented nest failures, 92% due to predation while nest success appears to be due to earlier nesting, higher placement, and removal of “exotic herbivores” as well as restoration of habitat (Caldwell, 2010). Eggs/Incubation: According to the Encyclopedia of Life “Eggs are ovate with an incubation period of 18 days” (citing Baicich and Harrison 1997). Behavior: Forages on ground, scattering leaf litter. Sometimes called a passerine, a bird which perches. Habitat/Local Sites: Endemic to Santa Cruz Island. Did you know: According to the Smithsonian Conservation Institute, the Island Scrub Jay is one of the rarest birds in the US? Based on DNA sequencing by Rice et al. cladogramic analysis suggests that they are most closely related to Aphelocoma sumichrasti or Aphelocoma woodhouseii? Other studies of its relative, the Aphelocoma ultramarina, suggest “postglacial divergence.” The first part of its Latin binominal means “simple” + ”hair,” describing its “lack of striped or banded feathers in this genus, compared to other jays,” according to Wikipedia. 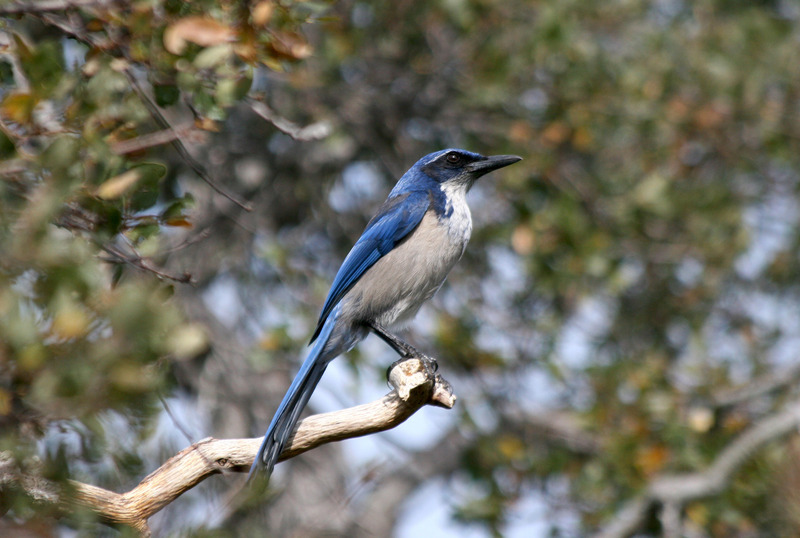 1) Atwood, J. L. “Breeding Biology of the Santa Cruz Island Scrub Jay,” In The California Islands: Proceedings of a Multidisciplinary Symposium, edited by D. M. Power. Santa Barbara: Santa Barbara Museum of Natural History, 1980, pp. 675-688. 2) Baicich, P. J. and C. J. O. Harrison, A Guide to the Nests, Eggs, and Nestlings of North American Birds, San Diego, CA: Academic Press, 1997. 3) Caldwell, Luke, “Reproductive Ecology of the Island Scrub-Jay (Aphelocoma insularis,” MS thesis, Colorado State University, 2010. 4) Henshaw, H. W. "Description of a New Jay from California," The Auk 3 (October 1886): 452–453. 5) Pitelka, F.A. “Speciation and ecological distribution in American Jays of the genus Aphelocoma,” University of California Publications in Zoology 50 (1951):195-464. 6) Rice, Nathan H; Martínez-Meyer, Enrique; and Peterson, A. Townsend. "Ecological niche differentiation in the Aphelocoma jays: a phylogenetic perspective",” Biological Journal of the Linnean Society 80 (no. 3, 2003): 369–383.—Note extensive bibliographical apparatus. FIELD NOTES: See “Natural History of Channel Islands,” 31 May-3 June 2013.